Las Vegas, NV (September 6, 2013 )- Lagasse’s Stadium at The Palazzo Las Vegas scores a touchdown every football season with its incredible atmosphere paired with delicious cuisine created by Celebrity Chef Emeril Lagasse. Named “Best Sports Lounge” by Vegas Seven, “Best Sports Bar” by Las Vegas Review-Journal and one of the “Top Sports Bars in Las Vegas” by Yahoo! Sports, Lagasse’s Stadium is revered by those who love to eat, drink and watch football. 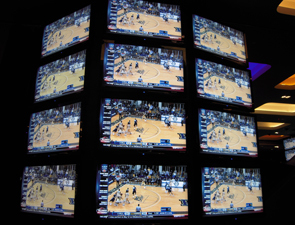 With more than 100 HD TVs including a 9 foot x 16 foot main TV, fans of the game never worry about missing the action. Those looking to make a few friendly wagers will be happy to know that The Palazzo’s race and sports book lies inside the venue. This season die-hard fans are in for a special treat during action-packed Monday Night Football as Chef Scott Pajak has created a special themed menu that pays homage to playing teams’ hometowns. The following “team-inspired menu” specials will be offered this season and reservations can be made by calling Lagasse’s Stadium at 702.607.2665.